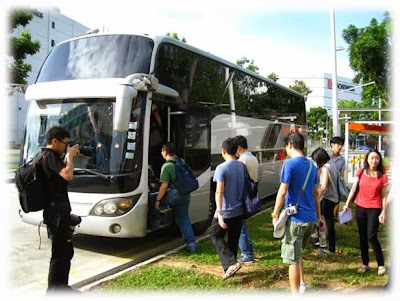 September 14, 2013 When the bus made its way to Changi Air Base, my thoughts went back to the ‘70s when I was posted to Changi Air Base for a short period of time during National Service (NS). The ride along Loyang Avenue reminded me of the time when Loyang Avenue was called Kuala Loyang Road before it was widened and re-named. This was the usual route coming from Tampines and Loyang Camps into Changi Air Base, entering the base through Cranwell Road into Tangmere Road. Those roads were very much a part of the public road network but not so these days having been rendered as a part of the high security area of RSAF Changi West Camp. Photo #1: MINDEF provided this comfy ride. Many people make the mistake of identifying Changi Air Base strictly as an air base establishment for the Singapore Air Defense Command (SADC), the pioneering name for the RSAF. This was far from the truth because there was another big military establishment, the School of Basic Military Training, SBMT. Photo #2: Temple Hill Officers Mess. 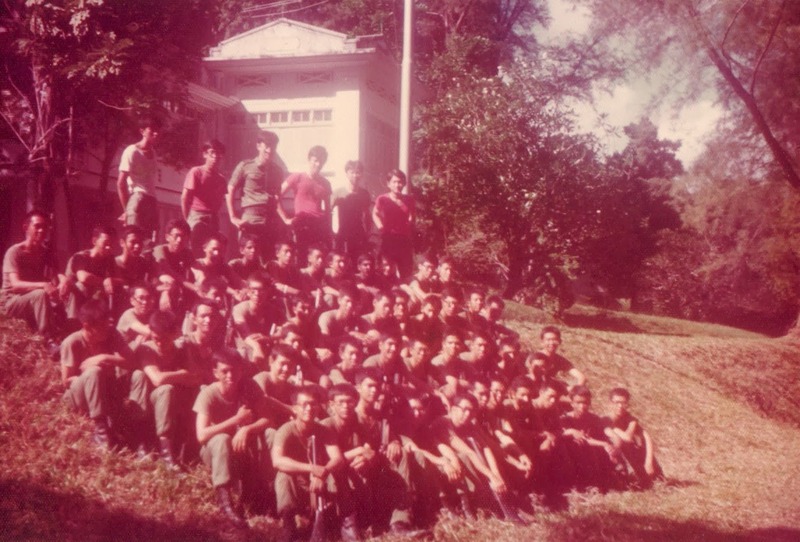 SBMT in Changi comprised 1st Battalion and 2nd Battalion SBMT; each battalion had 6 companies of recruits in any one intake. SBMT’s history mirrors the history of NS. In those days, infantry personnel were trained at the unit level; where there was always one company of recruits to three operational riflemen companies in a battalion set-up. Service personnel were trained at SBMT which provided manpower for vocations such as air force pilots, technicians, drivers, clerks, mechanics, and cooks. SBMT moved from Pulau Blakang Mati (now Sentosa) to Changi Air Base shortly after British Pull-out in 1971 before it moved to Nee Soon Camp around 1976. 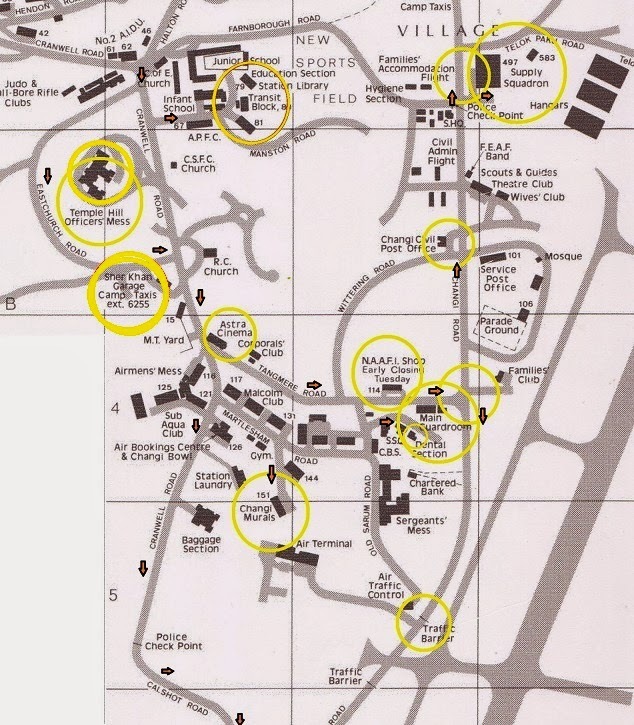 SBMT operated camps not only within the Changi Air Base but elsewhere in Tampines and Loyang. 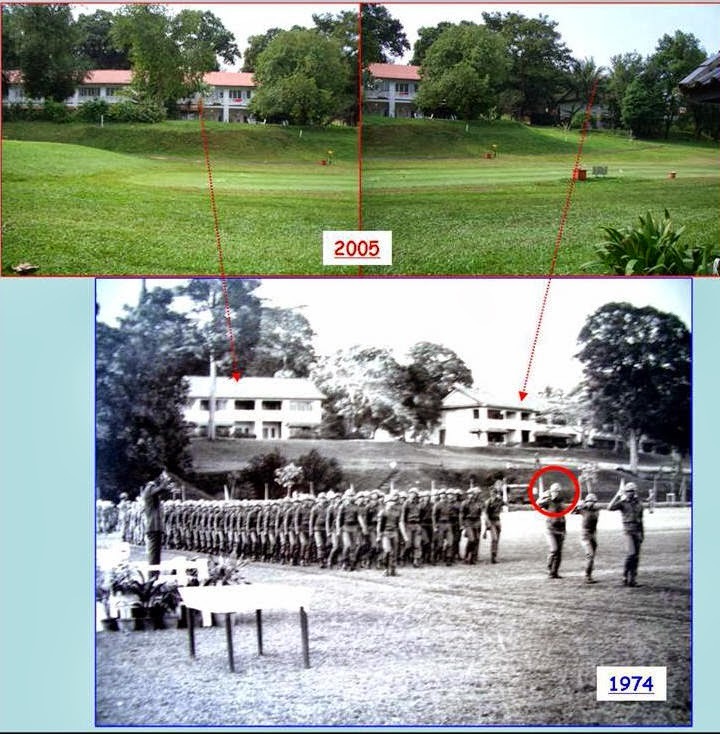 Pulau Tekong was never used by SBMT as a camp in my time except for field training and rifle range, though a live grenade range was available for operational infantry unit training. 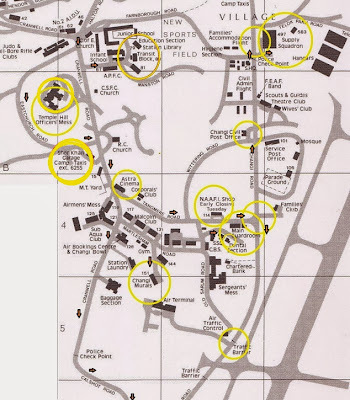 Within Changi Air Base, SBMT occupied the blocks around Martlesham Road, a block I recall was Block 117 which was HQ SBMT. The familiar M.T. Line with all the Bedford 3 tonners was a stone’s throw away in a fenced compound opposite the former ASTRA Cinema. You know that it can’t be any other military truck except a Bedford because these vehicles didn’t seem to have a clean engine start; bellowing dark exhaust smoke or giving out that pathetic “asthmatic sound” when the engine cranked each morning. Plate #1: Changi Air Base. Legends: Yellow indicated places the toured sites. The SADC (AETI) occupied the blocks nearer to Farnborough Road, i.e. Blk 79 vicinity. 1st Battalion Commando was over at Hendon Road. 2 SIB HQ occupied the empty barracks after SBMT moved over to Nee Soon Camp. Temple Hill was the convenient meeting place for the army and air force personnel where there was the Officers Mess. Here future friendships would be forged between the different Service Arms, as well as those between SAF regulars and NSmen over beer, darts and billiards. Officer accommodation was at Temple Hill where SBMT Officers occupied the chalets going up Temple hill on the right side of Temple Hill Mess, and the Commando unit officers occupied the chalets on the left side of the Mess. The SADC officer cadets (pilot trainees) occupied the blocks behind the SBMT officers chalets in the ravine. Life was very spartan, so it left very much to the individual to get himself acclimatized to the environment. For married personnel and those without a car, it was a big problem. Those who were posted to Pulau Tekong received a double whammy because Tekong did not have adequate fresh water supply. Each day, the Changi bumboats would transport 50 jerry-cans of fresh water from mainland Singapore to Tekong. Changi medic veterans from the Changi Medical Center at Block 137B (there was no Changi Hospital then) can tell you the extra daily duties medics had to undertake; dropping water purification tablets into the water tanks to prevent a potential outbreak of an epidemic attack. On the bright side, Pulau Tekong jetty provided a good supply of big fresh prawns for the dinner table if you cared to buy them from the Malay fishermen. Photo #3: SBMT recruits Take 5 after a run. The building in the background is one of three bungalows on Eastchurch Road. The bungalows were once the SAF Boys School Combat Wing, Logistics and HQ but is now the Changi Officers Mess. 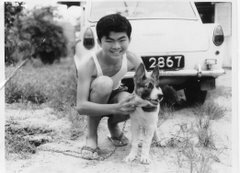 Doing DO duties was never a breeze but it did bring a sense of relief as one could take a tour of Changi in the “GP car” or in the Land Rover. Interestingly some of the sights included an actual WWII Spitfire aircraft body (left behind by the departing British RAF) at the corner of Nethervaron Road and Cranwell Road. Then there was Sher Khan Garage in Eastchurch Road; as the name indicates, the one-storey building comprised two annexed garages. 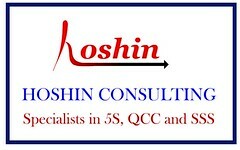 This Pakistani-owned business was famous for its private taxi service within the base. Sher Khan’s other business was the SHELL petrol kiosk over at Changi Village. The Passing-out-Parade (POP) was a great day for the recruits because two months had already been “consumed” from the two-year NS liability. POP was held at a sports field which bordered the Changi Golf course. Parade Officers were issued with the Smith & Wesson pistols, which was a first for me because I never handled this weapon before. In the run-up to POP, you could feel the exhilarating mood of the recruits as they were taken for that one last traditional run around Changi Air Base. Even the PES C recruits displayed great physical stamina to finish the distance. Photo #4: POP at the present Changi Golf Course. The buildings in the background are Blocks 59 and 60 Upavon Road. Separating Upavon Road from the golf course was Kuala Loyang Road (now renamed as Loyang Avenue). When nightfall came, the base was a very quiet place, only making it more convenient for couples in cars using the many unused car-parks and grass verges around Upper Changi Road. You knew this had to be lovers haunt when it came to Area Cleaning the next day. Changi Airport was still under construction and it would be after 1981 when the still of the night was broken by aircrafts coming and going. I am glad MINDEF was quick to put out this tour of Changi Air Base. For someone who once served at this place it was a feeling of not only home-coming. I achieved what I had hoped to do but had been unable to do so until now since the base had become another Out-of-Bounds site. Sadly I did not get to see many of the landmarks because many of the buildings were demolished and were now a part of the jungle. Gone were the former Changi Post Office, the Main Guard Room and the ASTRA Cinema. 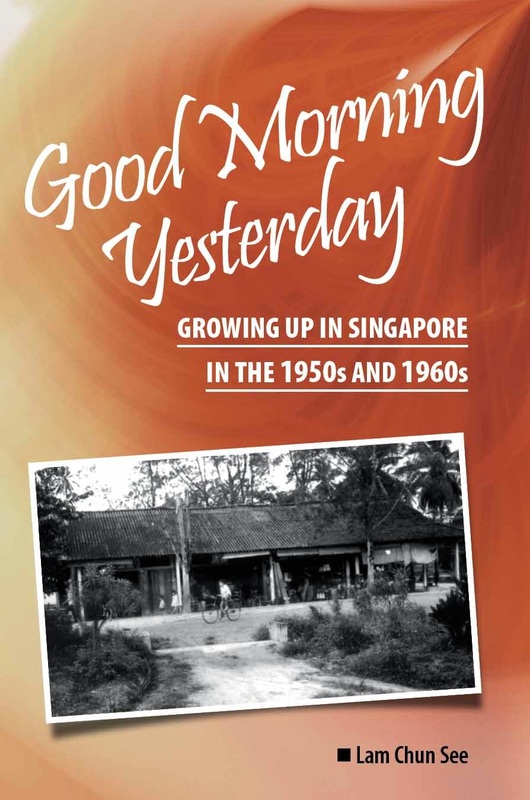 Though I am not privy to what are the future plans for Changi Air Base, I feel the least the authorities could have done was to keep Upper Changi Road accessible to the public - a road which brings back good memories when the place was called RAF Changi. I shall talk more about RAF Changi in another time.